Sasa. Sasa is a young man who is now the medical doctor for his village in Burma, a country so repressive that just having an education makes him an enemy of the government, an outlaw. Diane Namm's short film is the story of Sasa's more than ten year mission to seek that medical knowledge and bring it home to his people if only to relieve some of their pain. Sasa comes from a poor jungle village along the mountainous border between Burma and India. 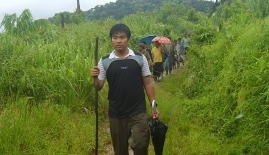 Before he became a doctor, the sick had to be hand carried 6 days through the jungle to the nearest hospital. Many of the sick didn't make it, including one of Sasa's childhood friends. Sasa vowed to become a doctor-- healer-- very young, but it was not easy. He had to leave home just to finish elementary school. Then there was college in India - he walked over the border teaching himself English and Hindi. Finally it was time for medical school. The small country of Armenia had a place, but Sasa couldn't afford the plane ticket. It was paid for by tiny contributions from poor villagers for miles around. He stayed in Armenia for seven years because he couldn't afford the trip home. More importantly, between each educational leap for Sasa, was increased suffering for Sasa's people at home. Beyond sickness killing his villagers too young, there was a plague of jungle rats, an attack that burned the village down, and atrocities committed by the same government soldiers. The horrors of his people meant Sasa couldn't finish medical school too soon: "Inside me, brokenness. I was broken. My heart was pierced into pieces to see that suffering," he told the filmmaker. He was overwhelmed by the urgency of their need. He longed to rush home and help. That was when he fell back on the power of his faith to get him through school. The triumph of Sasa's quest is revealed at the end of Namm's film. Namm shows us Sasa and surrounding villagers raising a structure that would be called The Place for Hope. Sasa not only finally returns to doctor his village, he would create a school to share his knowledge and teach practical medicine to nearby villagers as well. Sasa would manage to translate the fundamentals of care into yet another language: pictures, props, and spoken word for local people who couldn't read. Click here to listen to the Sasa story.